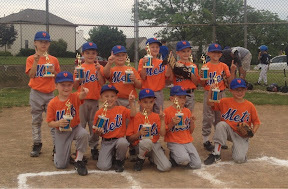 WingerBLOG: 20130701 - Met win GJLS A-Minor Championship!!! 20130701 - Up an into work. It was a Monday for sure and could not go fast enough. I rushed home, changed and off to the ball field. There was quite an audience: Doc, Gma&paW, Uncle John & Aunt Mary, Lucia and Gma&paB. The Mets showed up tonight and played a spectacular game. G had some good hits, turned a double play that made the crowd on both teams cheer in amazement. He then caught a pop up for the last out of the season and clinch the championship victory over the Indians, 12-4. We headed to BWs for dinner. Coach John and I left the festivities early to go to the GJLS baseball board meeting. It was a good meeting and the future of the league is not in as bad of shape as I thought. Home late.